It gives me great pleasure to communicate with you the young, fresh minds, who are preparing to embark on a career in the world of commerce and Industry, having completed your education at Neville Wadia Institute of Management Studies and Research. I hope that during your time at the Institute you have not only had the opportunity to imbibe and be equipped to face the world with confidence in the discipline that you choose but that the Institute has provided you with the value system with which you will conduct yourselves wherever opportunity takes you. I am sure that over the years ahead you will make this Institute proud of your accomplishments and achievements. The institute would greatly appreciate that you not only continue your connections with it but when you progress in life you bring back to Institute your learning’s, in order to share them with the students and faculty of the time. I am sure that you will make the contribution which all citizens need to, in whatever their field to, the society and the nation of which this Institute can be justly proud of. With all good wishes for a long, happy and successful life! 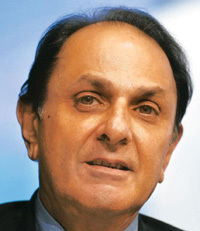 Mr. Nusli Wadia, the President of Modern Education Society, is a leading Industrialist and Philanthropist. He is the Chairman of listed companies like Bombay Dyeing, Bombay Burmah, Britannia Industries besides being a Director of reputed companies like Tata Steel, Tata Motors and Tata Chemicals. He is also the Chairman of Board of Governors of VJTI, Mumbai the Chairman of the Wadia Hospital for Children and Women. He has also been a member of the Prime Minister’s Council for Trade and Industry from 1989-2003.